TATS A KOOL CHALLENGE: Fun Day! I wonder if it could possibly have anything to do with AGE.....and a decided lack of enthusiasm for standing in a field all day queuing up to do the different activities. There are never enough to occupy us all of the time,.....maybe it had something to do with November and rain....which gradually seeps into your bones!! We had the use of our Community Hall and the Youth Club leader very kindly said that we could use their new hall as well. In true Girl Guide fashion we left the place as we found it. The organisation was superb...all the children were checked in by their parents on arrival and checked out before they left. All coats and bags went into gigantic plastic sacks...It's the first time ever that we haven't had belongings left behind. ....there were more but these were the cutest! 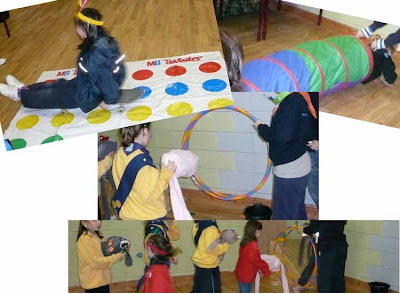 This day was also great because there were only ourselves and the other town in our District....2 Brownie packs, 2 Ladybird groups and 2 lots of Guides plus Ranger Guides. About 90 youngsters and 22 Leaders/Rangers....manageable. At some regional fundays we might get 600 children!! This is just half of the hall! The theme for the day was Thanksgiving so every activity (almost) had some tenuous American association and each was explained to them. The Friendship sticks they were to decorate and then swap at the end of the day. They had to include 3 spots, red green and yellow like traffic lights. Let me explain the thinking. When all was well the sun came out....yellow...for Sunny Brownies. they liked this...but we had to string it out a bit....before we could move on. ...who thought up all this....well not me this time! On to making head dresses to remember the native Americans who already lived there. 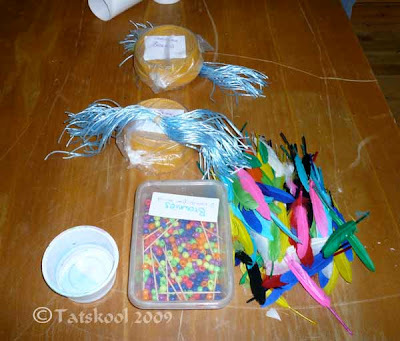 Feathers, beads, corrugated paper (colour coded for each group! ), staples and string! Next the ages and groups were mixed up and we had to do 10 out of 16 challenges...vaguely related to America...we threw the turkeys thro hoops into a bucket, dressed up and were pulled in a box across the ocean, were pulled on a skateboard across the ocean, crawled thro tunnels, made stick men, threw wet sponges at photos of....and stuff. Plenty to keep us occupied in our 5 mins allowed. 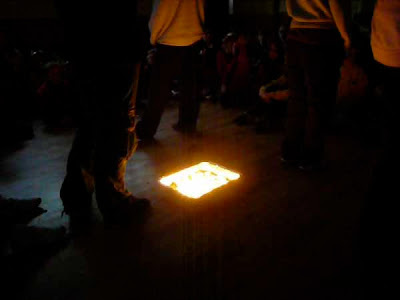 Then it was snacks and drinks, followed by a fabulous campfire....a large foil tray filled with night lights...and the lights out. .....a big tidy up and we all agreed that it was the best ever and we should do it again.....and it was only a 10 minute drive home!!!! I didn't realise that Thanksgiving was celebrated in Ireland as well as in America - is the connection due to the large number of Irish emigrants? The turkeys are gorgeous! No Maureen it isn't celebrated here, but as you say there is a big connection, more Irish in America than in Ireland! We just chose that theme for the time of year. We often have a theme for get togethers. I worked with a Brownie pack in Sydney for 2 months and had lots of Aussie theme meetings when I came back. Oh! Thank you. I felt as though I actually did get to attend the celebration. 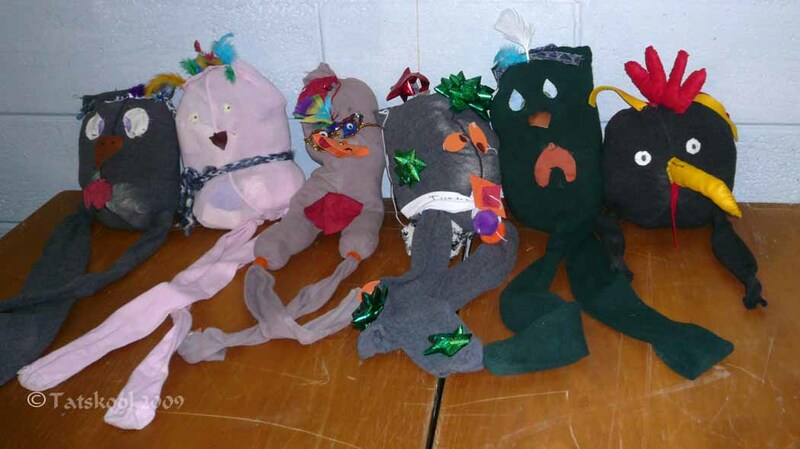 What fun crafts, projects and games. 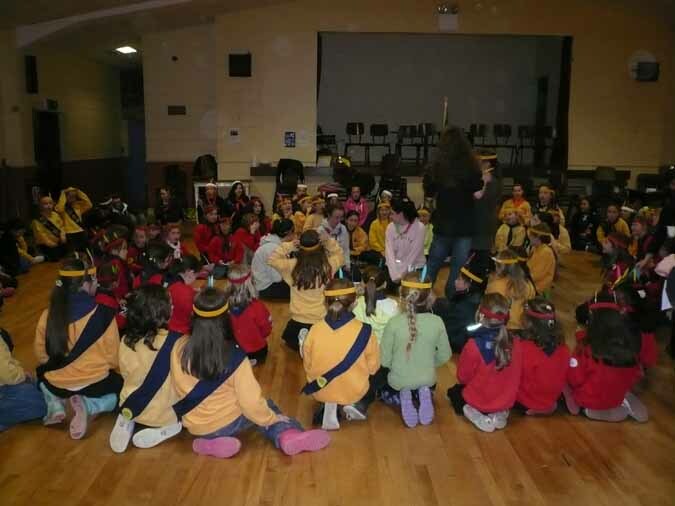 I loved being a brownie scout when I was in the fourth grade. 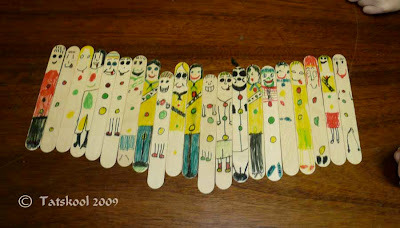 We made clothespin people (remember the old clothespins) Mom pulled me out when the group went on an over-night. She was afraid I'd fall into the river. (never mind we lived BY the river and I avoided sidewinders and rattlesnakes all the time. But I really loved the group while I was able to be a part. So much fun ~ I use to assist my MIL with Weblos (8 yr old boys) for the pine car races. That looks like a fun day! I called my Brownie over to the computer and showed her what you guys were up to. This is her first year and she is excited - so far mostly about the vest and badges. That girl LOVES to accessorize! Her troop gets to go to Santa's workshop in a couple weeks and make Christmas crafts. That will be fun! Hi Ridgetatter, I wrote that especially for you, glad you enjoyed it. I used to make clothes peg people too. 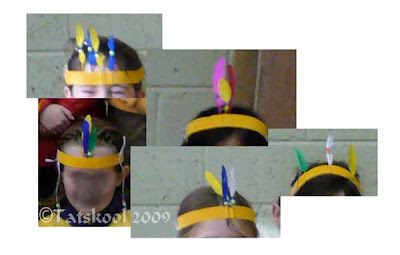 Dress them with bits of material, mum made our clothes. What a pity you didn't get to go to the overnight event. Hi Sewmuchfun, please contact me...link is in my web site. We are looking for Brownie groups to take part in a tiny project we are planning for Thinking day next year and also groups to write to. What a wonderful event! You had some really cute ideas there, and it sounds like the kids had a lot of fun -- much needed, too, considering the weather as of late. I'm so, so sorry to learn about the heavy rains and the flooding. I hope people are okay and are able to get clean drinking water. And I'm also sad to hear about your beautiful bonsai bowls and the tiny little trees. They were all beautiful after so many years of dedicated care. Not sure if the city has its drinking water back yet but the big clean up is in full swing. more heavy rain still forecast. 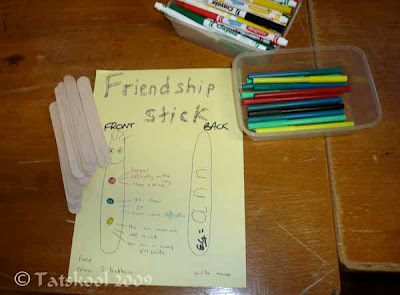 Hi Bonnie,the friendship sticks were a wonderful idea, so easy.